Late last week the Senate Finance Committee approved the “Expiring Provisions Improvement Reform and Efficiency (EXPIRE) Act.” The bill will extend a number of expired or expiring tax provisions, including the Renewable Energy Production Tax Credit (PTC) and Investment Tax Credit (ITC). The bill now goes to the floor of the Senate for debate. If the bill becomes law it will allow wind energy developers to qualify for tax credits if they begin construction by the end of 2015. 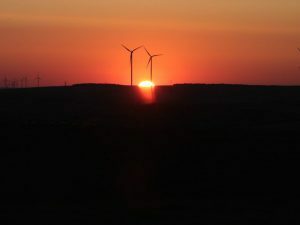 Despite the strong growth in wind energy, the on-again-off-again inconsistency from Congress, lurching from expiration to short-term extension has “wreaked havoc on the wind industry” according the the Union of Concerned Scientists (UCS), creating a “boom-bust” cycle of development at at time when consistent support of a vital American industry is most needed. Enacted as part of the Energy Policy Act of 1992, Congress, in its dearth of leadership, has allowed the PTC to expire five times since then. 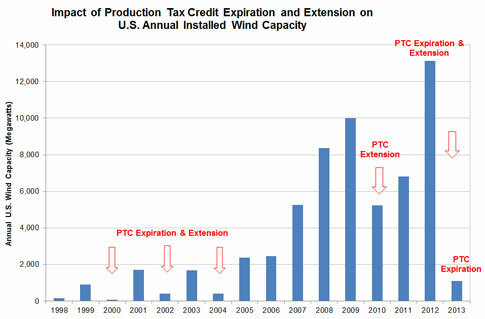 The resulting crash in wind development projects after each expiration of the PTC has resulted in a drop in installation ranging from 76 to 93 percent, along with job losses and reduced economic development. The chart below from UCS uses data from the Department of Energy and the American Wind Energy Association to display this boom-bust cycle. 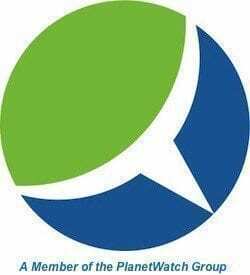 While the PTC last expired at the end of 2013, a provision in the American Tax Relief Act of 2012 allowed qualified projects under construction before January 1, 2014 to qualify for the PTC. The Senate Finance Committee acknowledges the need for comprehensive tax reform instead of stop-gap measures such as the EXPIRE Act. Committee Chairman Ron Wyden (D-OR) said this is the last time the committee will deal with tax extension provisions, focusing in the future on tax reform. Many in Congress still assert the PTC “picks winners” in the marketplace. Senator Pat Toomey (R-PA) offered an amendment doing away entirely with the PTC and other tax provisions. His Republican colleague, Senator Charles Grassley, called such arguments out for the “intellectual dishonesty” that it is – citing the decades of tax provisions for oil and nuclear energy.